Is a clean technology that can turn a variety of low-value feedstocks like waste (MSW), biomass, carbon-such as coal, petroleum coke into synthesis gas (syngas). The process gasify this matereal in a higher temperature of 3,000 °C+ (5,432 °F) with very little air or oxygen. Gasification uses only a fraction of the oxygen that would be needed to burn the material. Heat is supplied directly by partial oxidation of the carbon in the feedstock. Ash remains as a residual. The syngas can be burned in a turbine to produce electricity or further processed to manufacture chemicals, fertilizers, liquid fuels, substitute natural gas, or hydrogen*. The PCS is a system whose principal feedstock is hazardous and nonhazardous waste. Using EAWC Energy Module, including steam heat to energy or waste heat to energy. The Plasma Arc Flow™ is a patented technology based on flowing the target liquid waste through a submerged electric arc between two electrodes. The arc decomposes the liquid molecules into atoms and forms a plasma around the tips of the electrodes at about 10,000°F / 5,500 °C. The Plasma Arc Flow moves the plasma away from the electrodes and controls the formation of Syngas that rises to the surface for collection. The Syngas is a cost-competitive synthetic gas made from many liquid wastes such as sewage, sludge, animal manure, glycerin, used antifreeze, some oil-based liquids and waste water. Syngas is a hydrogen-based fuel that has a combination of hydrogen, carbon monoxide and inert trace gases. The Plasma Arc Flow exhaust has been certified by an automotive laboratory accredited with the US Environmental Protection Agency (E.P.A.) to surpass all E.P.A. requirements without a catalytic converter, and is the only fuel that produces oxygen when it burns, making it dramatically cleaner than gasoline, diesel, and natural gas. The synthesis gas produced is composed of hydrogen (55-65%), carbon monoxide (30-35%), carbon dioxide (1-2%), water vapor (2%), and trace gases (0.5-1%). 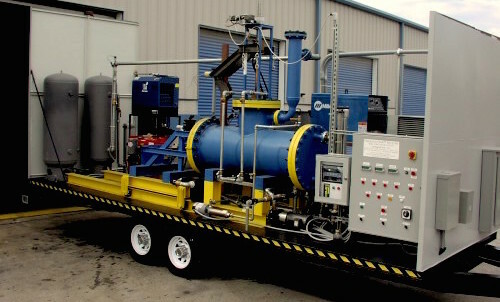 The PLASMA ARC FLOW™ process gasifies or sterilizes a number of liquid wastes into usable byproducts. GASIFICATION MODE: is suitable to completely gasify target liquids for the maximum conversion of liquid to fuel and is most suitable for oily or hazardous wastes that require elimination. The waste is converted into Syngas and carbon precipitates. In this mode the liquid is completely gasified. STERILIZATION MODE: is intended solely to sterilize target liquid wastes such as sewage, agricultural wastes or any effluent where eliminating bacteriological activity is beneficial to convert the waste liquid into a fertilizer and irrigation water. This results in the production of Syngas, carbon precipitates and the same quantity of sterilized liquid. In this mode the liquid is retained but completely sterilized. Waste-to-energy (WtE) or Energy-from-Waste (EfW) is the process of generating energy in the form of electricity and/or heat from the management of waste. The system is able to produce energy from waste and other fuels without direct combustion. These technologies have the potential to produce more electric power from the same amount of fuel than would be possible by direct combustion. For Example, 1000 tons-per day of waste is processed at a typical large municipality. The operation's daily output, could be hundreds of thousands Kilowatt hours, millions of gallons drinking water and millions of cubic feet of valuable hydrogen gas for sustainable power generation. Plasma-Arc-Flow (PAF) refers to the newly-patented technology, consisting in flowing the liquid feedstock through a submerged electric arc, so as to prevent the recombination of hydrogen and oxygen into water, increase fuel production and decrease CO2 and other contaminants. PAF Recyclers is used in the continuous recirculation mode of the liquid feedstock through the electric arc until all molecules are decomposed by the arc and converted to syngas plus solid residues. 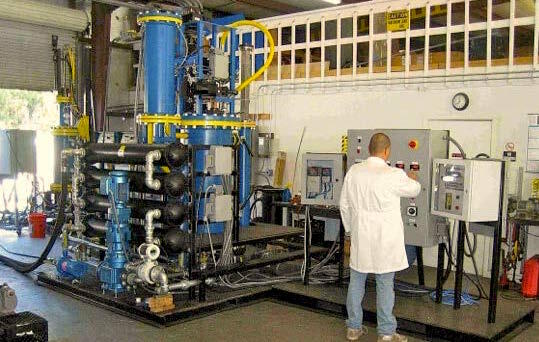 Refers the use of PAF Recyclers via one single passage of the liquid feedstock through the arc and then its removal from the PAF module for downstream treatment. The mode is recommended for biocontaminated liquids with up to a maximum of 1% TSS, such as city or ship sewage. 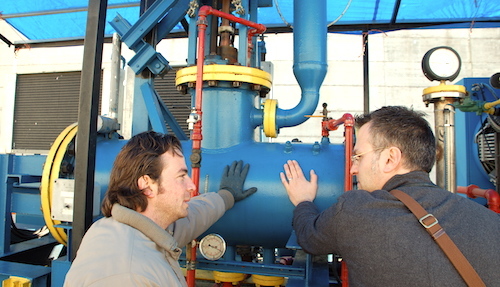 The Linear Mode completely sterilizes the liquid feedstock, produces syngas by decreasing BOD and other contaminants, and polarizes the remaining liquid so as to admit much more efficient and less expensive downstream treatments as per local needs. Refer to the dual use of PAF Recyclers in the Total Mode (recirculation of liquid feedstock through the arc) generally fixed at 100 gpm in a 300 Kw recycler, and the use of the Linear Mode (single passage) at a controllable, generally lower flow, such as 30 gpm. This dual mode allows the sterilization of highly contaminated liquid feedstock up to 10% TSS, such as city sludge, farm biowaste and other wastes by adapting the Linear Flow to the case at hand.